Announcing the Fourth Annual Fastrack User Conference! We are currently preparing for another year of informative and fun offerings during our three day event in April 2013! 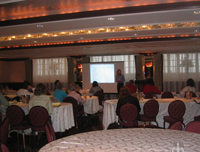 Mark your calendar and start making travel arrangements to attend the 4th Annual Fastrack User Conference scheduled for April 25th and 26th, 2011. The Conference is FREE to our users, with no registration fees and provides an opportunity to network with other Fastrack users from all over the country! Meet our staff, the people you talk to from day to day, whether it is in our Training Department, Support Center, Computer Services or Technical Support. Put a face with the voice you so frequently work with! The conference dates allow you stay and spend a long weekend in New York City or on Long Island, with a number of options for fun! The city – a short 40 minutes from the conference center – offers world class Restaurants, Theater and Night Life, the Island offers Beaches, Vineyards and other activities including Golf and Shopping! We will be dedicating the first day, April 24th, 2013, to a single all inclusive fee based, optional Training offering. This day will be focused on Training Courses designed for the beginner, intermediate and advanced user of the Fastrack suite of software, including focus in each operational area offered on the Fastrack system – HME, IV and HHA. Optional modules will be covered in detail, including Integrated Intake, Home Health Scheduling, Automated Warehouse, Field Operations and Scoreboard. We will also be providing specific focus on operational areas such as Inventory Management, Cash Receipts, Reporting and more! Please click here to see what classes are being offered! Please click here to register online or click here download the User Registration form in PDF. Please click here download only the User Training Registration form in PDF. Please click here to view the Conference Agenda or click here download the Conference Agenda in PDF. Please click here download a PDF of the Fastrack User Conference General Information.